As we were planning our trip to Machu Picchu and the surrounding areas, we decided from the start to stay in a single town: Ollantaytambo. It seemed like a town that offered a lot of possibilities. Located at the end of Peru’s Sacred Valley, Ollantaytambo is the town where many people begin the last leg of their journey to Machu Picchu. 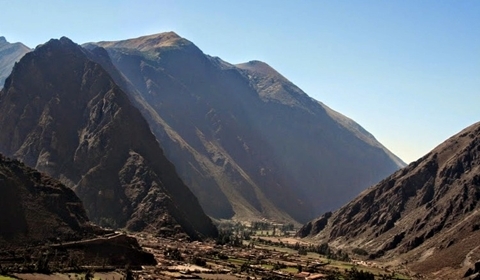 According to various sources, this Incan village has some of the oldest continuously occupied dwellings in South America. The Tripadvisor.com reviews and photographs looked positive and interesting, with many people expressing that they wish they’d stayed there—or they wish they’d stayed longer. To us, those comments sounded like an invitation to stay a week. We wanted to plan some activities as well as leaving time to wander aimlessly. One of the local tour companies, KB Tambo Tours, advertises a variety of tours ranging from mountain biking to paddle board tours to horseback riding. 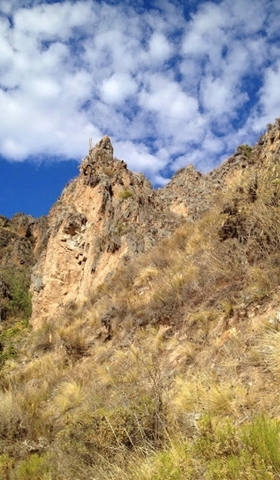 We contacted KB (an American ex-pat) about a full-day horseback ride to Inti Punku, the Sun Gate above Ollantaytambo. Interestingly, he responded that he was considering removing that particular trip from KB Tambo’s offerings. Apparently he had just taken several people on this ride. He told us that some of the group were “stressed” at its steepness and the fact that, at times, the humans needed to hike rather than ride. His concern was making sure people enjoyed their travels. In the same breath, KB said it’s an absolutely incredible day trip and, although he hadn’t decided whether or not to continue offering it, we should try to go. We listened to KB’s trepidations and carefully considered what he said. We still wanted to arrange this trip. I contacted Hugo at Casa de Wow (the hostel where we were staying) and asked if he could arrange it. 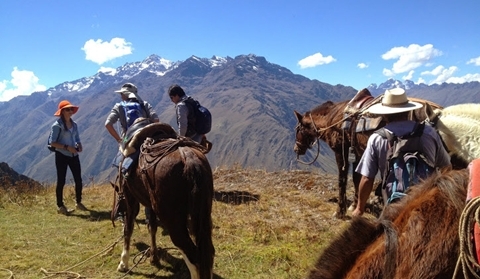 We were in luck—Hugo contacted the horse owner and planned to join us on the ride. Hugo’s emailed comments were equally interesting: “Horses that we use for our tours are not horseback riders galloping across the plains with your hair pinned back but rather they are slow and steady walking horses that are able to climb up and down the steep terrain. The horses tend to be on the smaller side. We mention this so that our guests know what to expect.” Given the earlier emails from KB, I loved and appreciated Hugo’s “galloping across the plains with your hair pinned back” comment. Our horseback ride to Inti Punku was on! Bright and early one morning, Hugo, Dan, Annie, and I headed off with our water bottles, sunscreen, sack lunches, hats, cameras, and a GoPro video camera to meet the horses on the opposite side of the town. Just like in the old western movies, we jumped up on their backs and headed off on our adventure. Notice that we didn’t take time to sign a jillion liability waivers as are typical in the U.S. Don’t expect those in Peru—travel at your own risk. Pretty quickly, we encountered some steep slopes and steps on the path. The horses did not hesitate (although I might have). The path narrows a lot in places, often with a steep drop to the right and an incline to the left. The surface of the path is often rough, loose and rocky. Although the horses take this path regularly, its roughness can be daunting, especially if you’re used to many of the “trail rides” in the U.S., which have the risk level of a merry-go-round. I was happy to have listened to the forewarnings of both KB and Hugo. A few times when I was scared, I did what any well-educated person might do: I simply closed my eyes! What I don’t see doesn’t scare me. Besides, I assume my horse wanted to make it back safely too. The trip to Inti Punku is approximately three or four hours long with the return trip taking just as long. If my memory serves me correctly, we hiked less than an hour on the upward journey (reread that UPWARD part and add in high altitude breathing). On the downward journey, we probably hiked well over an hour (possibly two). It is clear that the trip should be advertised as both a ride and a hike, neither for the faint of heart nor weak of spirit. With those warnings made clear, GO! The views along the way are simply incredible. 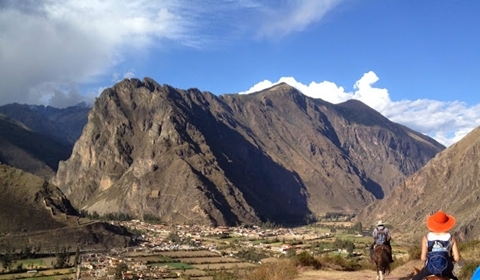 At first, we rose slowly above the town of Ollantaytambo, with the Urubamba River valley below. As the agricultural terraces and ruins got smaller from distance, the views of the snow-capped Andes Mountains became more prominent. The patchwork of villages, farms, and the valley began to look like a painting as the trail passed through the stone quarries where the Incas carved many of the massive stones for the sacred temple at Ollantaytambo. Finally, after hours of enjoying the long upward journey and continuously changing landscape, we reached the ruins of the Sun Gate, Inti Punku. Words simply do not describe the majesty of this site well enough. The joy of this journey is not so much in the ruins themselves but in the views framed by the Sun Gate. Inti Punku is an astronomical and strategic overlook built by the Incas to serve as a watchpost for the access routes to Machu Picchu from the Amazon Jungle . . . 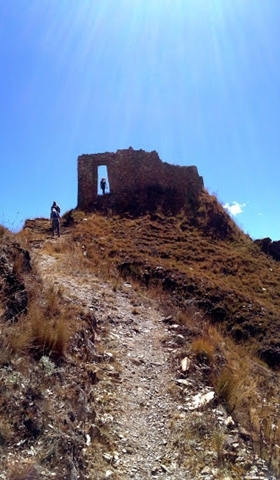 It has viewpoints to 4 different routes towards Machu Picchu, and also has astronomical connections in terms of the lighting it features during solstice events and other important times. Peru is in the Southern hemisphere and we visited in early June, so the days were short and the sun set early each day—around 5:30 p.m. while we were there. So after lunch, water, and a rest for humans and horses at the Sun Gate, we headed back down the path. After riding down a portion of the steep trail (and knowing from the trek up that the steeper parts were ahead of us), we were happy to dismount and “give the horses a break.” Ha! The reality is that I would have been terrified to be on horseback for parts of that trail coming down. As we hiked, Hugo pointed out various plants, mountain ranges, and stone formations. 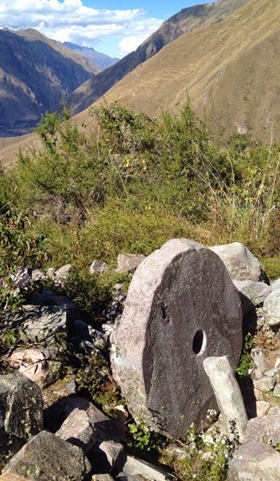 We passed a partially completed stone wheel and axle, left behind centuries ago when the Spanish invaded and the Incas stopped construction in Ollantaytambo. 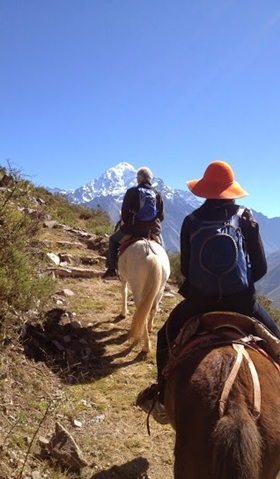 Eventually, we caught up with the horses again, remounted, and headed home to new colors, new shadows, and new spectacular views of the Sacred Valley. Lisa, A well crafted article. Your style elicited many images for me, as I looked over the side of the trail into the beautiful scenes below. And above. 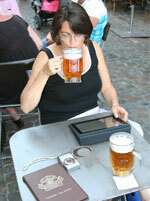 Although you could easily be a travel writer, please don’t think about it. You would never be in the States, and we would perish from the loneliness of not seeing you much. Thanks Bob! Be sure to read the entire set of Peru installments! Great detailed article, really enjoyed it. How would you rate this ride for inexperienced horseback riders? I am considering it, really want to see the panorama from Inti Punku, but I just don’t know the difficulty. The ride itself is less “difficult” than scary in terms of heights. The horses know what to do. You also need to be in shape for hiking. That may be the most important part–footing is rough, altitude is high, and hike is steep at times. It really is a mix of riding and hiking. Hi – this sounds awesome. Do you remember how much it was for your horseback riding experience? Thanks, Lisa! This really was an amazing article. I found myself forgetting it was I who you spoke to, and wondering what would happen next !